According to the the EdNet Insight report, “Educational Technology Trends: State of the K-12 Market 2016”, 67% of US school districts are using Google Classroom as an LMS. Unfortunately, Google does not yet support the IMS LTI standards for interoperability. 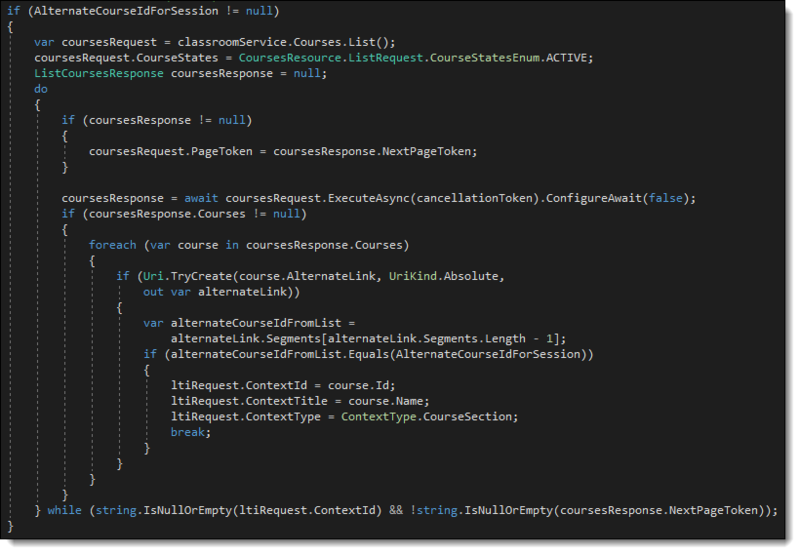 In this post I walk through a proof of concept (POC) that converts a request coming from Google Classroom into an LTI request to a Tool. Use a Classroom share button to add a specially formatted link into the course. The link points to a .NET Controller (Gc2LtiController) that will create the LTI request and post it to the LTI Tool. When the Gc2LtiController receives the get request from Google Classroom, it uses several Google APIs to get the data needed to form the LTI request. The Gc2LtiController also needs to determine which key and secret to use to sign the request. I imagine this can be done using the information collected above, but since this is all happening in a browser session, you could also prompt the user for a code or another clue to find the right key and secret. The Gc2LtiController then signs the LTI request and posts it to the Tool. I used Visual Studio Community 2017 and .NET Core 2.0 for everything in this POC, and I’ve put the entire solution up in github. This post walks through some parts of the POC and explains how they work. Google’s share button will create a Coursework resource with this link. The Gc2LtiController will use the request URL to look up the matching Coursework resource. If this link has been assigned more than once to the same course, then Gc2LtiController will use the most recent. That is not a problem if your Tool does not treat each assignment uniquely. For example, if your Tool is a game without bookmarking or scores, then it does not matter which Coursework resource it was launched from. The ShareUrl property is calculated when the page is rendered. Skip the nonce if you don’t need it, and use a URL to your actual LTI tool. You can use http://lti.tools/test/tp.php. It is a very handle Tool for testing that validates the LTI request and dumps the parameters. The preview image is broken because Google’s screen thumbnail capture service can’t access localhost. The Gc2LtiController will recognize when Google is trying to get a thumbnail image and you can supply whatever you want in return. Now let’s walk through the Gc2LtiController. The Gc2LtiController (Google Classroom to LTI) will receive a get request when the teacher or a student in the classroom clicks on the Link. Gc2LtiController uses clues in the request (e.g. 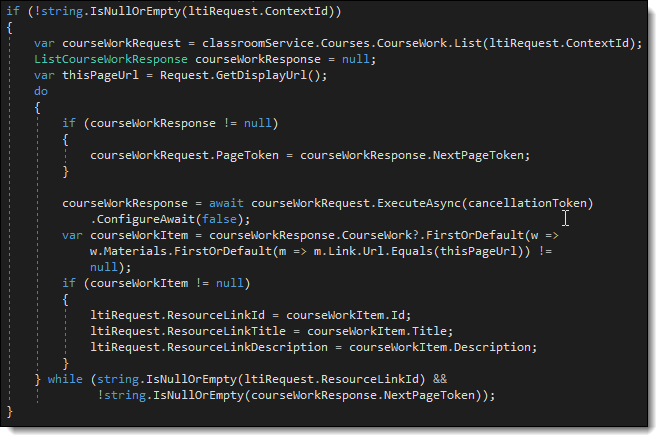 the Referer header), the Google Classroom API, and the Google Admin Directory API to fill in most of the required and useful parameters of an LTI request. The only required parameters this POC version of Gc2LtiController cannot determine is the oauth_consumer_key and secret. I’ve hard coded the key and secret for https://lti.tools/test/tp.php. A real implementation will need to determine the key and secret based on the information gathered from Google, or by asking the user to supply a clue such as a code. I found the Google Classroom API .NET Quickstart and the web application section of the OAuth 2.0 quide useful when writing Gc2LtiController. I ran into one glitch: Google’s quickstarts and .NET API libraries were created before .NET Core 2.0. This was really only an issue with the Google.Apis.Auth.Mvc library. For this POC, I used @buzallen‘s replacement he calls Google.Apis.Auth.AspMvcCore. A Google account (for you as the developer of the project). A second Google account with Google Classroom enabled for testing. A G Suite for Education account is preferred, but this works with other account types with some degradation. Download @buzallen‘s Google.Apis.Auth.Mvc replacement he calls Google.Apis.Auth.AspMvcCore. You will probably need to fix the Google.Apis.Auth.AspMvcCore project reference in the gc2lti-poc solution so that it points where you downloaded the project. 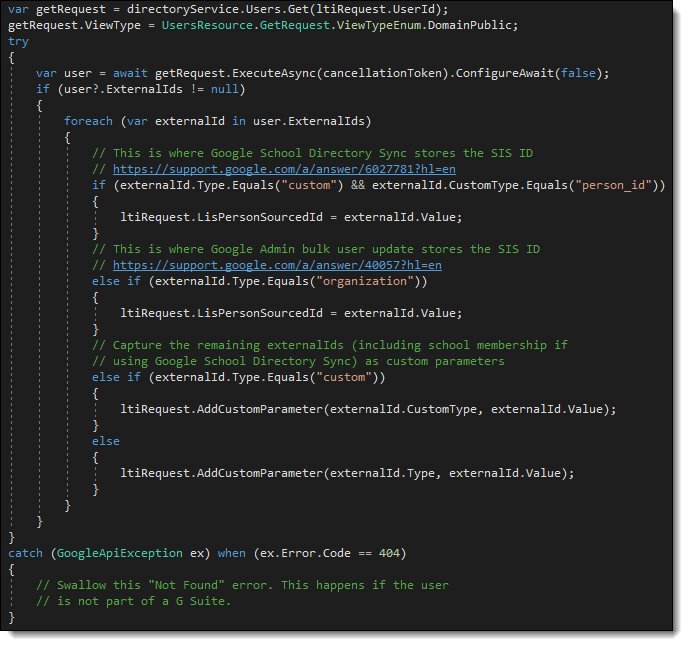 Enable the Classroom API and the Admin SDK using the Google Developers Console. See Google’s Classroom Quickstart for details. Create an OAuth Client ID for a web application, also using the Google Developers Console. Add https://localhost:44319/AuthCallback as an authorized Redirect URL to the Client ID. Right click on the gc2lti project and select Manage User Secrets. Store your Client ID and Secret in the secrets.json file. You should be able to run both the catalog and gc2lti projects now. The rest of this post walks through some of the interesting bits of Gc2LtiController. And since nonce has no value to Gc2LtiController by itself, there is no matching parameter. The full request URL (including the nonce if provided) is used to find a matching Coursework resource later. Google calls the default (Index) Action many times for different purposes. The first time is to capture a thumbnail sized screenshot of your LTI Tool. This is called by one of Google’s servers (not through a browser), so it is not a good time to actually launch your tool. I suggest returning a generic page that looks nice. The next time the Index Action is called, the teacher or student has clicked on the link hoping to launch the Tool. To form an LTI request, Gc2LtiController needs a bunch of information from Google. That means the controller needs authorization. Google School Directory Sync for G Suite for Education customers. Google Cloud Directory Sync for G Suite customers. G Suite Bulk Account Update for G Suite customers. There is no way to add syncing information to normal Google accounts (i.e. anyone@gmail.com). This entry was posted in Google, LTI and tagged Google Classroom, IMS, LTI. Bookmark the permalink.